This quarterly financial report has been prepared by management as required by section 65.1 of the Financial Administration Act and in the form and manner prescribed by the Treasury Board (TB). It should be read in conjunction with the Main Estimates, Supplementary Estimates and approved allotment transfers from Treasury Board Central Votes. It has not been subject to an external audit or review. Created by an Act of Parliament in 1875, the Supreme Court of Canada is Canada’s final court of appeal. It serves Canadians by deciding legal issues of public importance, thereby contributing to the development of all branches of law applicable within Canada. The independence of the Court, the quality of its work and the esteem in which it is held both in Canada and abroad contribute significantly as foundations for a secure, strong and democratic country founded on the Rule of Law. The Supreme Court of Canada is an important national institution, positioned at the pinnacle of the judicial branch of government in Canada, separate from and independent of the executive and legislative branches of government. The Office of the Registrar of the Supreme Court of Canada (ORSCC) provides all necessary services and support for the Court to process, hear and decide cases. It also serves as the interface between litigants and the Court. Further information on the ORSCC’s authority, mandate and programs may be found in its Report on Plans and Priorities 2016-2017. This quarterly report has been prepared by management using an expenditure basis of accounting. The accompanying Statement of Authorities includes the ORSCC’s spending authorities granted by Parliament and those used by the ORSCC, consistent with the Main Estimates, Supplementary Estimates and approved allotment transfers from Treasury Board Central Votes for the 2016-17 fiscal year. This quarterly report has been prepared using a special purpose financial reporting framework designed to meet financial information needs with respect to the use of spending authorities. The ORSCC uses the full accrual method of accounting to prepare and present its annual departmental financial statements that are part of the departmental performance reporting process. However, the spending authorities voted by Parliament remain on an expenditure basis. 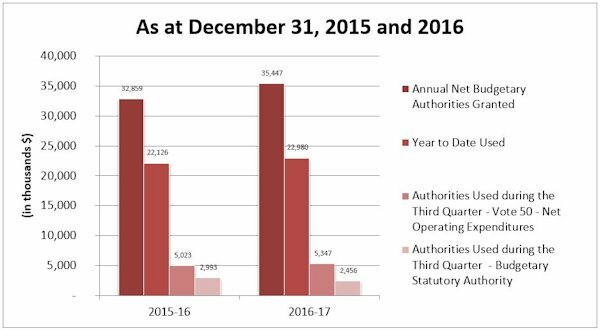 This section highlights the changes in authorities provided and expenditures incurred as at December 31, 2016 compared to the same quarter of the prior year. Overall, the ORSCC’s authorities increased by 8% while quarterly spending decreased by 3% over the same quarter ending December 31, 2015. The overall proportion of authorities used on a year-to-date basis (65%) is in line with that of the previous year (67%). An increase in Budgetary Statutory authorities ($431,640). A decrease of $89,000 from the Budget 2016 reduction. The allocation of planned expenditures slightly differs between both fiscal years due to funding received to enhance security at the Supreme Court of Canada in the first quarter of 2016-17. Other than for this initiative, there are no significant changes to the ORSCC’s planned expenditures to report for this period. An increase of 3% ($105,205) in Budgetary Statutory expenditures. A decrease of 18% ($536,699) in Budgetary Statutory expenditures. Fluctuating replacement or maintenance schedules. A net decrease of 18% ($536,699) was noted in Budgetary Statutory Expenditures in comparison to the same quarter of the previous year. The variance between the two quarters is mainly attributed to a reduction in relocation expenditures. Other expenditures have remained stable in comparison to the same quarter of the previous year. Comparison of Third Quarter Authorities Granted and Used – The diagram illustrates the variation in thousands of dollars for the Annual Net Budgetary Authorities Granted, the Year to Date Used, the Authorities Used during the Third Quarter - Vote 50 - Net Operating Expenditures and the Authorities Used during the Third Quarter - Budgetary Statutory Authority as at December 31, 2015 and 2016. Annual Net Budgetary Authorities Granted – Figures showing the amounts the ORSCC planned to spend as at December 31, 2015 and 2016: $32,859,008 in 2015-16 and $35,446,559 in 2016-17. Year to Date Used – Figures present the cumulative amounts the ORSCC spent as at December 31, 2015 and 2016 respectively: $22,125,848 and $22,980,221. Authorities Used during the Third Quarter - Vote 50 - Net Operating Expenditures – Figures showing the amounts the ORSCC spent: $5,023,366 for the third quarter of 2015-16 and $5,346,870 for the third quarter of 2016-17. Authorities Used during the Third Quarter– Budgetary Statutory Authority – Figures showing the amounts the ORSCC spent: $2,992,536 for the third quarter of 2015-16 and $2,455,837 for the third quarter of 2016-17. This departmental quarterly financial report reflects the results of the current fiscal period in relation to the Main Estimates for which full supply was released on June 23, 2016. The ORSCC is funded through voted parliamentary spending authorities (72%) and statutory authorities (28%) for operating and personnel expenditures. With the exception of funding received for enhancing security in 2016-17, the ORSCC’s operating budget has remained fairly stable for several years. The fiscal restraint on its operations continues to pose a serious challenge as the organization must continue to absorb rising operating costs which results in limited funding available for investments in its current asset base and strategic priorities. Mandatory contributions to Central Agency initiatives also create further financial pressures. Following the 2013 Speech from the Throne, the ORSCC, like other government departments, must also contend with an operating budget freeze. Funding for wage and salary increases taking effect during fiscal years 2014-15 and 2015-16 will not be received; nor will the ongoing impact of these adjustments be funded in the future. The ORSCC continues to reduce its financial risks by dedicating time and effort to ensure that all resources are used in the most efficient and effective manner possible. Opportunities aimed at increasing efficiency and reducing costs remain a priority for the organization. Strategies aimed at prioritizing new investments while postponing others that are less critical to the operations are utilized. Greater financial controls and improved resource planning and forecasting are also helping to mitigate these risks. Despite these strategies, gaps still exist and the ORSCC must be strategic in its approach to prioritization and resource allocation. The Honourable Mr. Justice Malcom H. Rowe was appointed as a Justice of the Supreme Court of Canada on October 28, 2016. The financial impacts of the above nomination were minimal in the third quarter of 2016-17. There were no other significant changes in the ORSCC’s operations, personnel and programs over this reporting period. * Includes only Authorities available for use and granted by Parliament at quarter-end.